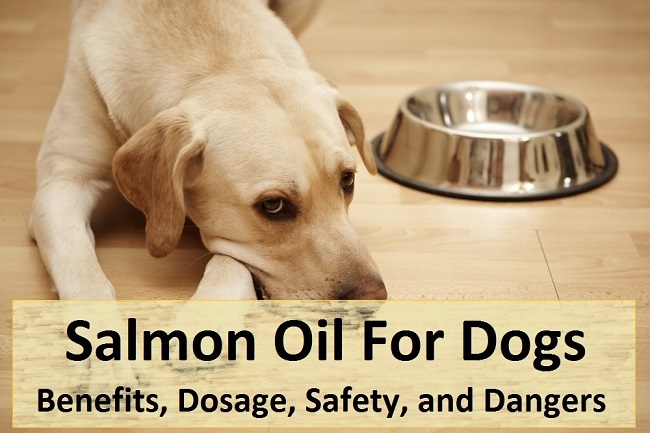 Salmon Oil For Dogs – Benefits, Dosage, Safety, and Dangers. Fish oil is a very important supplement that every dog owner should consider adding to their furry companion’s diet. When it comes to our dog’s diet, it’s easy to get frustrated and lost in all the do’s and dont’s within. Conventional dry kibble and canned food doesn’t always supply our pets with the essential nutrients that they need, usually containing mysterious ingredients, additives and unnecessary fillers. Veterinarians will recommend high quality foods, and some people will go to the extent of actually feeding their dogs a raw diet, according to their carnivorous nature. Now, despite being carnivores, feeding our dogs a raw diet isn’t the prime option for all pet owners, and even dogs. Some pets have different dietary needs and sensitivities which is something every pet owner needs to consider carefully while planning out their dog’s diet and supplement program. Salmon oil is considered one of the most beneficial oils to both puppies and older dogs. Not only does it benefit their overall health, but it also improves the skin and coat, immune system, vision, cognition, etc. These benefits are mainly due to the high levels of Omega-3 fatty acids present in salmon oil, specifically in the form of EPA (eicosapentaenoic acid) and DHA (docosahexaenoic acid). These Omega-3 fatty acids are essential not only for dogs but for human health as well. They are mainly found in cold-water fish and represent a very necessary role for maintaining optimal health. 2.1 So, is salmon oil good for dogs? 3.1 So, is salmon oil safe for dogs? 4 How to Use Salmon Oil for Your Dog. 6.0.1 Why should I feed my dog salmon oil? 6.0.2 Are there any side effects to feeding my dog salmon oil? 6.0.3 Can give my puppy salmon oil? 6.0.4 Are salmon oil supplements better than providing my dog real meat or fish? 6.0.5 How do I use salmon oil for my dog? 6.0.6 Will salmon oil make my dogs smell fishy? 6.0.7 Will salmon oil help my dog’s allergies? When it comes to salmon oil, the list of benefits can be quite long, especially thanks to its abundance in both EPA and DHA, the most important Omega-3 fatty acids for your dog. However, it’s quite common for pet owners to pose this question: is salmon oil good for dogs? Salmon oil lubricates the skin, leading to a glossier and healthier coat. 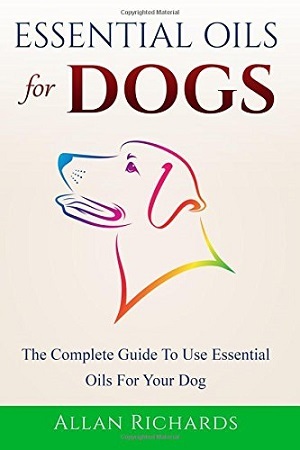 Supports in mental development of puppies. Improves cognitive abilities in adult dogs. Regulates and boosts the immune system. Helps dogs with allergies and autoimmune diseases. Reduces inflammation due to arthritis and inflammatory bowel disease. Supports kidney and heart disease. Slows down cancer and prevents it as well. Helps prevent cachexia due to cancer. So, is salmon oil good for dogs? Given the amount of benefits, along with the fact that there are hardly any dangerous side effects from supplementing your dog’s diet with salmon oil, we would say: absolutely! Salmon oil is not only great for your dog’s overall health, but it also benefits almost every part of their bodies, from coat and skin, to their bones, joints and even their brain. eHow states that “dogs metabolize fats and oils very differently from humans, and adding salmon oil to your dog’s diet won’t make him fat, but fit and maybe smarter, too”. Once establishing all the benefits of using salmon oil as a supplement for your dog, many will wonder if there are any side effects of if it’s safe for canine consumption. We can tell you why salmon oil is safe for your dog, but as a pet owner, you should also know that every dog is different and will respond differently to salmon oil. Some dogs might present some side effects. It’s important to keep in mind that not all dogs will present these side effects. While administering the first doses of salmon oil, you must be vigilant of any side effects to make sure the salmon oil is compatible with your furry friend. Many people will argue that humans and dogs digest salmon oil differently and that it does not necessarily create weight gain problems. Aside from these side effects, the real risk in salmon oil supplementation is providing top quality. Any kind of fish oil should be kept away from light, heat and air. It’s best to keep it stored in dark bottles in the refrigerator, or it might become rancid. Not all salmon oils are created equally. There are many concerns of mercury poisoning in the supplements so it’s recommended to every pet owner to carefully read labels and to look for molecularly distilled products. You should always go for a salmon oil that says “cold-pressed” since it’s a gentler technique that doesn’t break down the benefits of the fatty acids in it, creating a higher concentrated oil. Some pet owners have reported using salmon oil for human consumption with their dogs, to make sure they’re providing top quality. So, is salmon oil safe for dogs? Salmon oil most likely is a safe supplement for most dogs, keeping in mind that some dogs might present resistance or side effects to it. What’s most important about supplementing salmon oil is looking for high quality products that will ensure that you provide the best for your dog and not an oil that has all the beneficial Omega-3 fatty acids disrupted or poisoned with mercury. How to Use Salmon Oil for Your Dog. For your dog to enjoy the benefits of salmon oil, it must be administered orally. You definitely do not want to use this oil topically, which will most likely result in a fishy smelling dog. Salmon oil is optimally absorbed orally and with the proper dosage. Please keep in mind that I am not a veterinarian and that you should always consult with your veterinarian of choice before using any of the following information. Dogs Naturally recommends 20 to 55 mg per pound of body weight, whether it’s from real fish or oil. The amount may go up if you’re using the oil to treat a specific condition. You must consult your vet or an animal nutritionist to determine exactly how much salmon oil you should supply your dog if you’re using it to address a certain illness. In order for your dog to actually benefit from the use of salmon oil, make sure you supply it daily. Discontinue its use if you dog presents any persistent side effects and check the oil to make sure if it’s fresh and read the label to ensure quality. Ask for a Certificate of Analysis (COA) from the manufacturer before you buy their product (this is to ensure that the product is free of any toxins such as mercury). Supplement with vitamin E, preferably from a whole food source. Supplementing grain-based diets with fish oil isn’t a good long term solution as both will deplete the vitamin E in your dog. Choose a high quality fish oil in the natural triglyceride form. Not only is this better absorbed, but there will be less oxidative damage. Consider using both fresh whole fish and fish oil to give your dog a full array of healthy fats. Why should I feed my dog salmon oil? The regular use of salmon oil is not only beneficial for your dog’s overall health, but it also improves the skin and coat, the immune system, their fertility, vision, cognition, and their joints. The use of this supplement helps a wide range of diseases such as cancer, arthritis, inflammatory bowel disease, allergies, etc. It also leads them to live a longer life! Are there any side effects to feeding my dog salmon oil? All dogs are different, and much like us, some will have different responses and side effects to new things. Some common side effects include stomach pain, diarrhea (especially when dosage is too high), dizziness and bad breath. It also useful to keep in mind that your dog may be experiencing side effects due to the quality of the product itself. If your dog presents any unusual side effects when using salmon oil, discontinue its use and try another brand. Always consult your veterinarian beforehand to make sure salmon oil is a good choice for your pet. Can give my puppy salmon oil? Absolutely! Salmon oil is especially beneficial to fetuses and puppies alike since its rich Omega-3 fatty acid content aids in their brain development and overall well being, which leads to a long and happy life. Keep in mind that for puppies you need to provide the smallest recommended dose of salmon oil. Are salmon oil supplements better than providing my dog real meat or fish? To find meat from grass-fed animals is not always an easy, nor a cost effective measure, especially if you have a big dog, or more than one dog. Some pet owners choose to supplement Omega-3 fatty acids with canned sardines or tuna. When different factors tie in such as price, availability, convenience and dog compatibility, supplementing your dog’s diet with salmon oil is oftentimes the best choice. How do I use salmon oil for my dog? Salmon oil is meant to be taken orally. Salmon oil can be found in liquid or in pill form. Keep in mind that salmon oil is very delicate on a molecular level. It must be kept away from heat and preferably in a dark container. It’s recommended to keep it in the refrigerator. All products of salmon oil must have the recommended dosage on its packaging. Make sure you consult with a veterinarian to determine the proper usage and dosage of the oil for your dog. If you choose a liquid form of salmon oil, you can mix the proper amount with their dry dog food, but make sure it’s the amount your dog will eat. If this mixture is left out for too long, the salmon oil will oxidize and no longer contain its beneficial properties. Some people will administer the liquid oil to their dogs orally, using a syringe. This method might or might not work for your dog, it all depends on its preferences. Many pet owners report that using the pill form of salmon oil is also efficient and it prevents the salmon oil from oxidizing. You can even use salmon oil made for humans, but keep in mind that you need to find a salmon oil that has been cold-pressed and that is high quality. Will salmon oil make my dogs smell fishy? Will salmon oil help my dog’s allergies? Salmon oil, and fish oil in general, are the most recommended remedies for dogs dealing with skin problems. The content of Omega-3 fatty acids in cold-water fish helps lubricate their skin and makes their coat soft and glossy. The lack of nutrients in their diet is probably what causes their allergies in the first place. It’s also important to note that grains can also create allergic reactions in dogs. The use of salmon oil to supplement dog’s diets is something that many pet owners have considered a success. 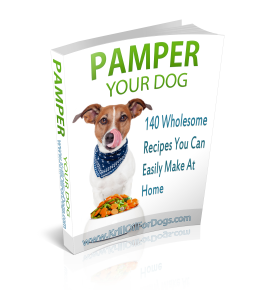 Many report that not only does it improve their pet’s lifestyle and energy, but it also helps them live longer and fight many diseases, including cancer and arthritis. Salmon oil’s inflammation reducing properties can do wonders on your dog’s health, along with all the other beneficial properties it contains. Omega-3 fatty acids are an important part of a dog’s diet, and whether you choose to feed your pet real fish, or salmon oil supplements, make sure that you’re giving your dog top quality and the appropriate amount. Be sensitive to your pet’s response to either the oil or fish, to determine the best option for your canine. A higher amount of salmon oil can be administered to your pet if you’re trying to help them fight any kind of illnesses. The side effects are minimal and do not apply to every dog. Remember to consult your veterinarian to determine what the best option is for your furry friend. A balanced and nutritious diet will ensure a long and healthy life for your dog.